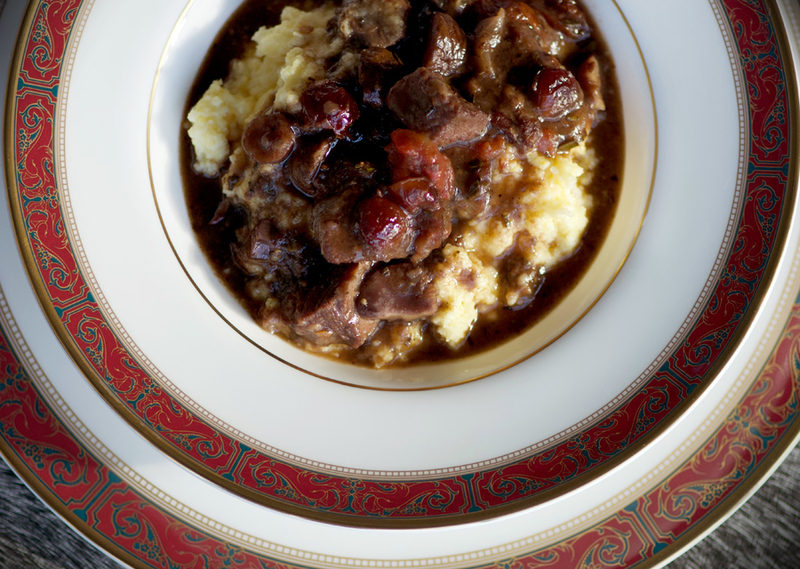 Special enough to serve at a dinner party, yet homey and comforting for a family night in, this lamb stew with chestnuts and cranberries is a favourite dish. Served over creamy polenta, and enhanced with mushrooms, pearl onions and a little tomato, it’s a comforting dish with sophistication. To save time, and also to avoid having to wait for chestnuts to be in season, buy packaged chestnuts that have already been peeled. Of course like pretty much all stews, this lamb dish tastes just as good when reheated the next day (maybe even better! ), so you if you want to make it ahead before company comes over, it will work perfectly. To begin, trim off any large areas of fat and season the lamb with salt and pepper. Dredge with all-purpose flour. Heat two tablespoons of olive oil over medium-high heat. Add lamb in a single layer, in two batches if needed to avoid over-crowding the pot. Sear until browned on all sides, about five minutes. Transfer lamb to a plate. Some of the flour will stick to the bottom of the pot and will turn a deep golden colour. 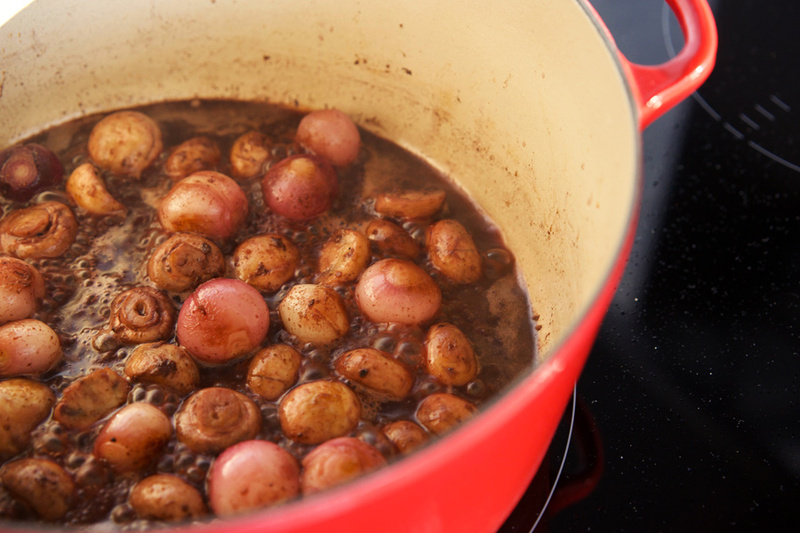 Adjust the heat down slightly if needed to avoid burning it—you’ll want to scrape this up to enhance the flavour of the stew in a few steps when you deglaze the pot with wine. Add a bit more olive oil and add the onions, cooking until golden, about five minutes. Add mushrooms, seasoning with some salt. The mushrooms tend to soak up the oil (as well as the bits of flour that will have stuck to the pot from searing the lamb). If the pan gets too dry add a bit more olive oil. Cook until the mushrooms are well browned, about six minutes. Next add red wine, scraping up the browned bits from the bottom of the pot. Cook until the wine is reduced by about half, approximately five minutes. Add reserved lamb, beef stock, chestnuts, herbs and tomatoes. Bring to a simmer, and then reduce heat to medium-low. Simmer for two hours. I have become addicted to the method of using gelatine as a way to add body to sauces and stews, once I read about the method on Serious Eats. So toward the end of the cooking time, I combine a packet of gelatine with about 1/4 cup cold water, mix to combine, and add to the pot. This gives the sauce a lovely silky quality. Once the meat is tender and cooked through, about two hours, add cranberries, and cook for two minutes more. Serve in bowls, spooned over creamy polenta. 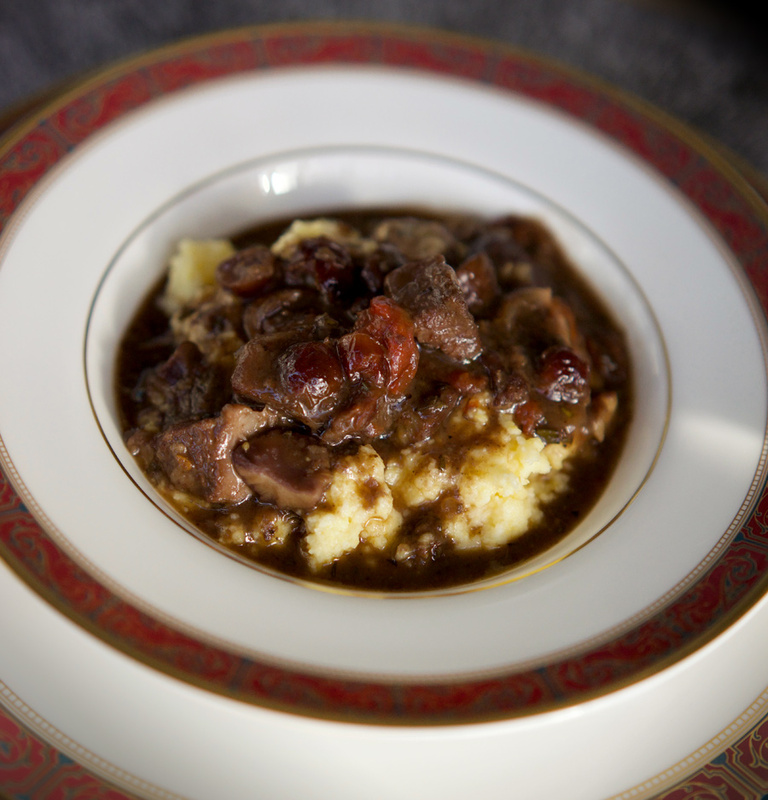 The textures of the soft chestnuts, savoury lamb, mushrooms and creamy polenta come together to create a unique and delicious meal. The cranberries add a lovely tart pop to brighten the dish and add just a touch of sweetness that plays off of the lamb really well. 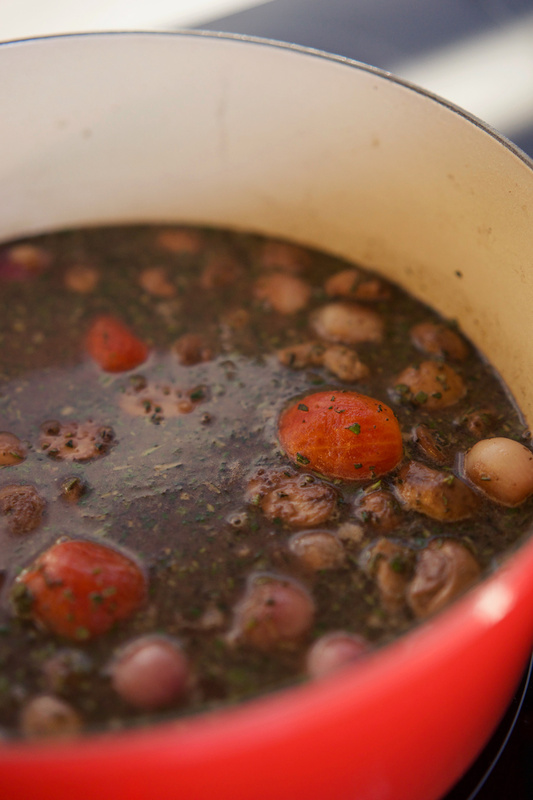 This is a wonderful stew sure to become a classic favourite in your recipe collection. 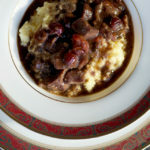 Recipe adapted from Martha Stewart’s Lamb-and-Chestnut-Stew. 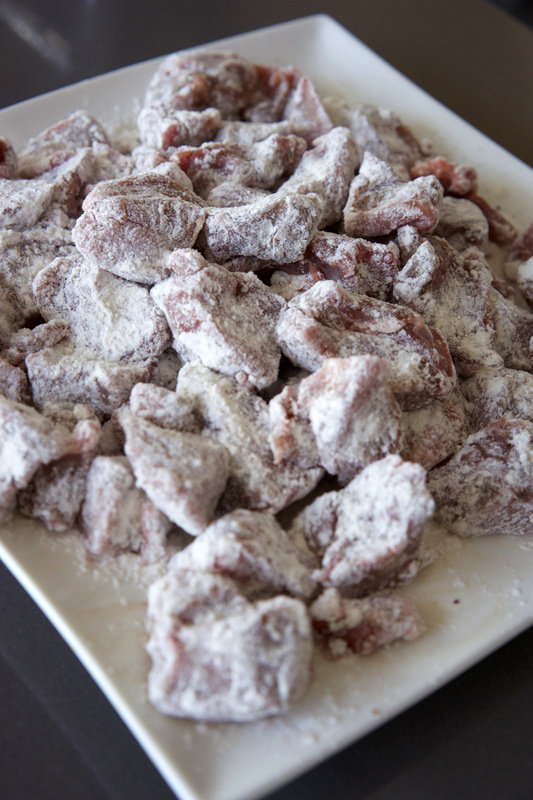 Trim the lamb of any large areas of fat, and season with salt and pepper. Dredge with flour, shaking off the excess. Heat two tablespoons of olive oil in a large Dutch oven over medium-high heat. 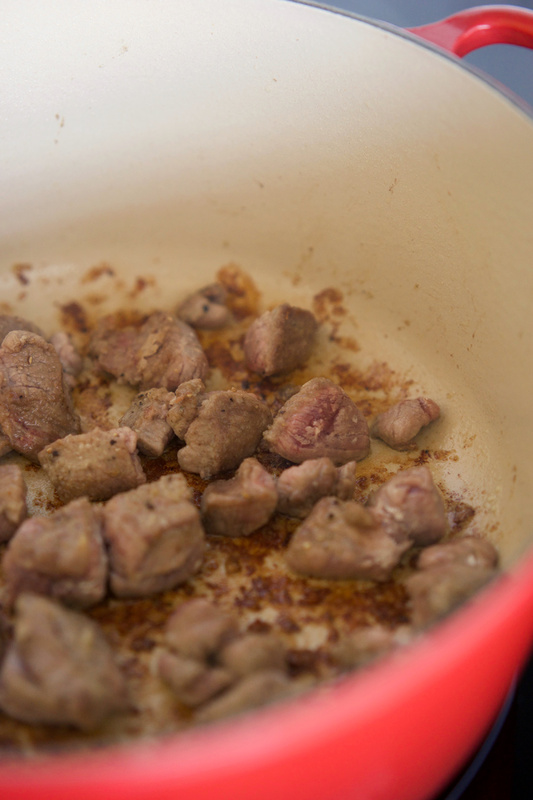 Add lamb in a single layer, in multiple batches if needed to avoid over-crowding the pot. Sear until brown on all sides, about five minutes. Transfer to a plate and set aside. Add additional olive oil to the pot, and add the onions, cooking until they are golden, about five minutes. Add mushrooms, season with salt to taste, and cook until well browned, about five minutes. 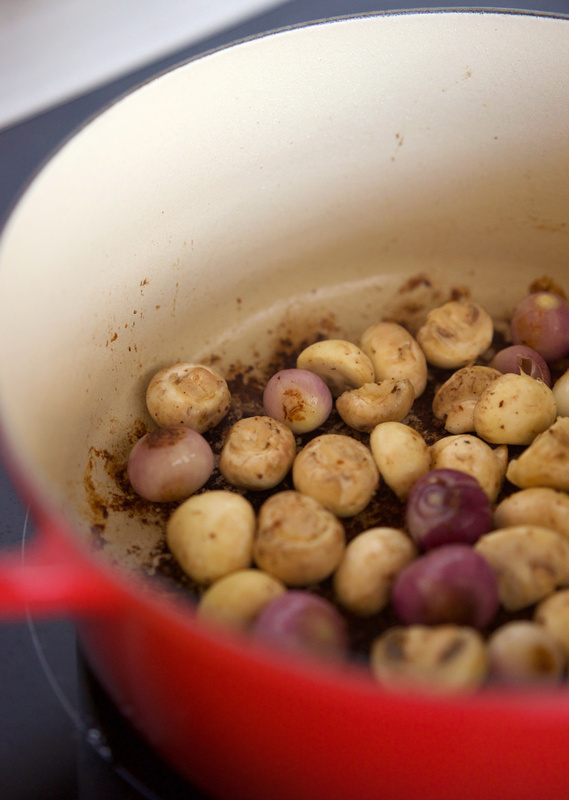 Add red wine, scraping up any browned bits from the bottom of the pot. Cook until the wine is reduced by about half, approximately five minutes. Add reserved lamb, beef stock, chestnuts, herbs and tomatoes. Bring the mixture to a boil. Reduce heat to medium-low and simmer for two hours. Combine gelatine with 1/4 cold water and stir to combine. Add mixture to the pot and cook until the body is silkier and slightly thicker, about 5–10 minutes. Add cranberries and cook for two minutes. Serve over a bowl of creamy polenta.